Activity Period today will be for NHS & FCCLA. All other students should report to homeroom. There will be a boys’ basketball meeting for boys in grades 8 through 11 on Monday, May 21 in the morning at 7:45 AM in the varsity gym. If you cannot attend please see Coach Leppelmeier. There will be a meeting for soccer players and their parents on Monday, May 21, at 7 PM in the theater. Congratulations to the baseball team for their BBC victory over Edon last night 6 to 4. The baseball team and softball team will host Fayette tonight starting at 5:00 PM. Good Luck! Jaret Rychener was the winner of the high jump last with jump of 6’2”. The girls 4 x 800 meter relay team of Liz Sauder, Nicole Foor, Kate Stuber, and Morgan Leppelmeier won the district title. Jaret and the relay team will move onto the regional track meet next week at Tiffin. Good luck to the track team on Day 2 of the district meet at Archbold High School on Saturday. NHS Members: We will be taking a group photo today during activity period for the yearbook. 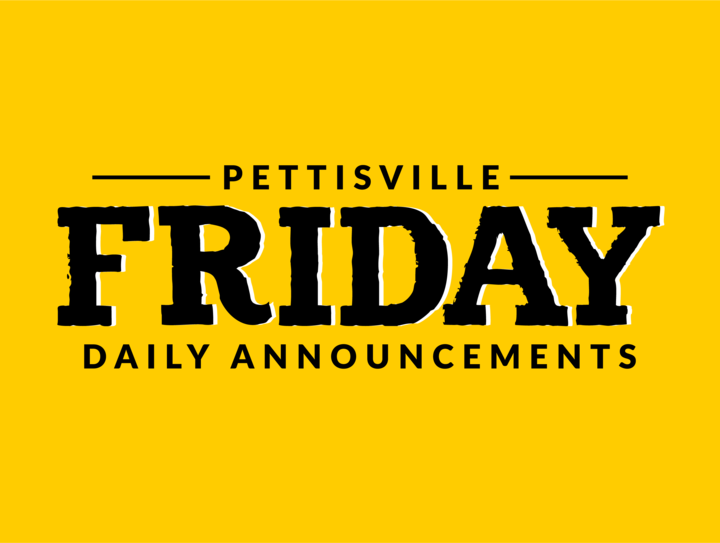 We will operate on the Pettisville Idol Schedule with Activity Period. FCCLA will meet for Activity Period today. Be sure to attend because we are electing officers for next year. Please excuse the following students from Period 2: Joel Flory, Daniel Holsopple & Calvin Nofziger. Students performing in PV Idol are excused 4th period to get ready for their performances. Ushers are also dismissed 4th period today. Performing students should eat lunch and report to the lower level seating of the Theater at 12 noon for final instructions from Mrs. Bacon. If you are part of Idol because you were asked to participate by Owen or Katie, you are not dismissed from classes early today. Everyone needs to bring a pencil to Idol today so you can vote for your top 3 performances. NHS members: We will be taking a group photo on Friday during activity period for the yearbook. We need you to dress up. Guys wear shirts and ties. Girls, please wear dresses or equivalent. All junior high students are welcome to attend FCA today at lunch in Mrs. Miller’s room. Enjoy a time of fellowship and some dessert with your lunch. The Music Production STEM students will meet after school tomorrow in the atrium to leave for Above Pete’s Garage near Adrian, MI. We need to leave by 3:20pm. Please return your permission form to either Mrs. Miller or Mrs. Meller. Also remember to bring money to stop for fast food on the way there for supper. The library will be closing for the school year Thursday May 17th. ALL books must be returned by May 22nd. Any books not returned will result in a lost book fine. Please check with Mrs. Horning if you have any questions. Have you ordered your Lariat yet? Yearbook receipts and reminders were sent home on Tuesday. Please check to see that you ordered one! We want to make sure you get to enjoy these memories for years to come. You can order by picking up a form in the office or from Mrs. Dadisman or by simply going to jostensyearbooks.com. Attention all high school and junior high students: The NHS is preparing a donation for the Archbold Fish Food Pantry--an organization that serves as a source of household necessities for many of Northwest Ohio's needy and homeless. NHS is asking all junior high and high school students to donate rolls of toilet-paper--a commodity the pantry greatly needs. Any roll you can donate will make a big impact. Please drop off your donation in Mr. Switzer's room. A belated congratulations to the 7th and 8th grade writing teams that competed at the Writers Ink competition last Friday at the Archbold ESC. They all did very well. In the 8th grade team writing rounds, the 8th grade team place 2nd. Congrats to all participants! The last session of the Forestry STEM module will meet today after school in Mrs. Meller’s science classroom. There will be a volleyball open gym for girls in grades 7-11 tonight from 7:15-8:45. Shout out to all who helped make the 2nd grade consumer fair a success. With your generosity, the second graders will be donating over $1400.00 to Brian’s Miracle Fund. Thank you so much! Three Pettisville high school students presented their projects at the Ohio Academy of Science State Science Day on Saturday at the Ohio State University French Field House. Jordan Skates and Kayla Wyse both received superior ratings. Josh Bock received an excellent rating. Today is the final day you can let Mrs. Meller know if you are planning to go to the Music Technology STEM trip to Above Pete’s Garage this Thursday, May 17th after school. The following students still need to see her: Matthew Christiansen, Theary Eash, Dylan Rash, Ella Richer and Angie Rosillo. HS Track Results from Montpelier on Saturday: Girls are BBC Champions!!! This is the 5th year in a row!!! Liz Sauder set a new BBC record in the 800 with a time of 2:24.88. The boys’ team came in 4th place.